Mixu Paatelainen has urged Anthony Stokes to make himself “a hero” by scoring the goals that will help maintain Dundee United’s Premiership status. United have agreed a loan deal with Celtic for the out-of-favour striker. The final decision about his short-term future rests with Stokes, who is also wanted by Hibs, as well as clubs down south. Inverness Caledonian Thistle have conceded defeat in their bid to United have agreed a loan deal with Celtic for the out-of-favour striker. The final decision about his short-term future rests with Stokes, who is also wanted by Hibs, as well as clubs down south. Inverness Caledonian Thistle have conceded defeat in their bid to land the player but Paatelainen revealed United’s talks with the striker have gone well. The manager is hopeful of there being a positive conclusion. 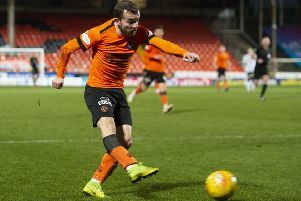 “The clubs agreed a few weeks ago when we approached Celtic,” he said, on the eve of tonight’s televised clash with the league leaders at Tannadice. Stokes is considering his options after Ronny Deila confirmed that he was being allowed to leave on loan. The Celtic manager stressed that the deal had to suit the Parkhead side as well as the player and Paatelainen realises that the length of time since the clubs struck an agreement with each other means it is likely Stokes is thinking long and hard about committing himself to a relegation dogfight. “Sometimes they go for you and sometimes they don’t,” he said. “I don’t think he has given an answer to anybody. He did tell me there were quite a few clubs interested in him. That doesn’t surprise me because he’s a quality striker and goalscorer. United skipper Sean Dillon welcomed the news linking the Tannadice club with Stokes, who, like him, is a Dubliner. He encouraged the striker to come to Tannadice and resuscitate his international ambitions before Euro 2016.